This is a very common variety of groundnut chutney. It is a good accompaniment of dosa, idly,upma and some people like it even for rice. I made it with red chillies, some people made it with green chillies only. Adding garlic is optional. Those who don't like or do not eat garlic can avoid them, rest is the same. Roast groundnuts till they turn brown colour or till we get the aroma of it. We can microwave them also. I prefer to roast them in a traditional way only. Heat oil in a fry pan. Saute black gram, mustard seeds, red chillies and green chillies. Saute it till the mustard seeds crackle and do not make red chillies to turn into dark. It will give a dark color to the chutney and the taste of it also become bitter. We can use the groundnuts with or without the skin. If we don't want the skin just remove it by rubbing the groundnuts between our hands. I prefer to use mix of it some skin removed and some with skin for chutney. In a mixer grinder add all the ingredients along with salt, garlic and tamarind streaks. Grind it to a fine paste by adding requirement amount of water. Heat oil in another pan, add mustard seeds, black gram, curry leaves and red chillies pieces. Add this seasoning to the chutney. 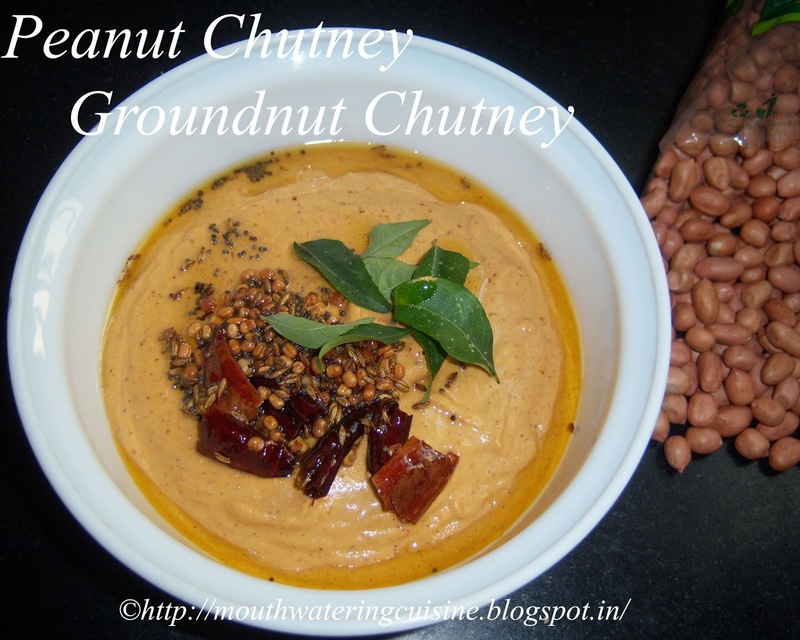 Serve groundnut chutney with dosa, idli or upma.